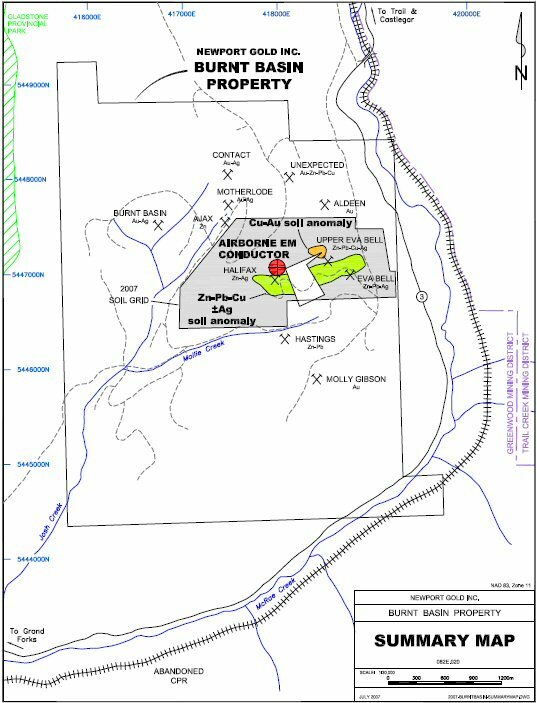 TORONTO, ONTARIO–(Marketwire – May 25, 2012) – Newport Gold Inc. (OTCQB:NWPG) (the "Company", "Newport") has confirmed the presence of high-grade gold mineralization at the Molly Gibson Mine at Newport's 100% owned Burnt Basin Property (the "Property"). The Burnt Basin Property covers 1,682 hectares and is located approximately 30 kilometres west of Trail, in the Greenwood Mining District of British Columbia. During the fall of 2011, Newport conducted geologic reconnaissance at the Molly Gibson Mine, including the collection of 68 rock grab samples. The samples were taken from numerous historic exploration pits, trenches, adits and shaft over an area of approximately 500 x 100 metres. Of the 68 rock grab samples collected, a total of 29 samples were submitted for gold fire assay, based on the presence of intense quartz-carbonate-pyrite (±pyrrhotite) vein mineralization. Of the 29 samples submitted for analysis, a total of four samples returned assays of greater than 1 gram-per-tonne (g/t) gold (Au), and up to 270 g/t Au (See Table 1, Figure 1). During 2011, all rock grab samples were submitted to ALS Minerals, Vancouver, British Columbia for gold fire assay analysis. Rock samples were crushed and pulverized to produce a pulp and a 30 gram sample split was mixed with flux to produce a dore bead. The bead was digested in acids and the solution analyzed by an atomic emission spectrometer (ICP-AES). Rock samples returning greater than 10 g/t Au by ICP-AES were subjected to gravimetric analysis. "We are pleased to confirm the potential at our Molly Gibson Mine following geological work conducted by the company," said Derek Bartlett, President and Chief Executive Officer, Newport Gold Inc. "These results highlight the potential value and opportunities associated with the Burnt Basin Property. While the Property hosts abundant gold showings, the Company's first priority is the Molly Gibson Mine. The Company is planning a work program on the Molly Gibson gold zone in addition to other high-grade gold zones on the Property during the summer of 2012." The Upper Adit and Lime Cut are approximately 150 metres apart and are located at the south end of the Molly Gibson gold zone. The Lime Cut is the most southerly location. Sampling in 2007 from the Purcell Adit and Inclined Shaft areas, located approximately 200 metres north of the Upper Adit, returned assays of 13.7 g/t Au (sample JBB-07) and 11.8 g/t Au (sample JBB-35). The same sampling program yielded samples assaying 26.1 g/t Au (sample JBB-38) and 29.5 g/t Au (sample JBB-37) at the Lime Cut and Twin Tunnels locations. The Molly Gibson mineralization occurs as small pods and lenses of semi-massive to massive pyrite-pyrrhotite that exhibit strong stratigraphic control, occurring in the immediate structural hanging wall of a band of crystalline limestone that contains layers of dense grey chert (historically referred to as jasperoid) and sulphides. Historical production reported for the Molly Gibson Mine between 1909 and 1940 totalled 315 tons (286 metric tonnes) at a grade of 1.05 ounces-per-ton (36.1 g/t) Au and 0.45 ounces-per-ton (15.3 g/t) silver. To view the "Summary Map", please visit the following link: http://media3.marketwire.com/docs/NWPGfig1.jpg. To view "Molly Gibson Showing 2011 Rock Sampling", please visit the following link:http://media3.marketwire.com/docs/np_map.pdf. Work on the Burnt Basin Property is supervised by Kristopher J. Raffle, P.Geo. (BC), Senior Geologist for APEX Geoscience Ltd. of Edmonton, Alberta. Mr. Raffle has reviewed the portion of the technical content of this news release as it relates to the Burnt Basin Property. During 2011, all rock grab samples were submitted to ALS Minerals, North Vancouver, BC for gold fire assay analysis. Rock samples were crushed and pulverized to produce a pulp and a 30 gram sample split was mixed with flux to produce a dore bead. The bead was digested in acids and the solution analyzed by an atomic emission spectrometer (ICP-AES). Rock samples returning greater than 10 g/t Au by ICP-AES were subjected to gravimetric analysis. Newport Gold Inc. (OTCQB:NWPG) is a newly incorporated Nevada company (incorporated July 16, 2003) formed for the purpose of mining exploration. The board of directors is made up of highly experienced individuals with over 150 years of experience in the geologic, legal and accounting fields and a track record of many discoveries to their credit. Certain information contained in this press release, including any information as to our strategy, projects, plans or future financial or operating performance and other statements that express management's expectations or estimates of future performance, constitute "forward-looking statements". All statements, other than statements of historical fact, are forward-looking statements.